Any business, small medium or large, can benefit from the sensible use of credit cards for business. These credit cards differ quite significantly from those you might already have in your wallet for personal use and understanding the difference between the two types of credit card is essential, as is choosing just the right credit cards for business to suit your needs. Why Use Business Credit Cards at All? Especially when they are just starting out many a small business person makes the mistake of using their personal plastic to make credit card purchases that are actually related to their business. It is important to begin separating business and personal expenses as soon as possible. If the business goes belly up one day it is the business, not the individual who owns it, that will be responsible for the debt. But if credit card debt is not in the businesses name, but is in your own instead that debt will not be covered by those protections. Credit cards for business also help really simplify the accounting process, another big boon for the small business owner. There is no need to bother trying to add up receipts or numbers scribbled on the back of a napkin (had to write the cost of that business lunch somewhere) if all of your expenses are laid out for you in one easy to read credit card statement at the end of every month. 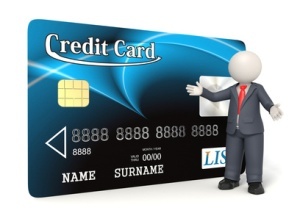 Lastly, the sensible use of business credit cards helps build your company’s credit profile. Building up a small businesses credit rating is as important, if not more so than taking care of your personal credit profile. The better your business’ credit profile is the more likely you are to be able to lease the machinery you need, secure a loan or get credit with other vendors. How Do You Get Approved for a Business Credit Card? If your business has been in existence for some time a business credit card application will be considered based on your business’ creditworthiness. On the other hand if yours is a brand new venture and you are a sole proprietor your personal credit may have to come into play. In this case it may be best to apply for credit cards for business from a company you already have a good financial relationship with, whether that is from a credit card company you have an in good standing personal credit card account or a bank where you maintain a personal or business checking or savings account. Which Business Credit Card Should You Choose? One of the other advantages of a business credit card over a personal credit card are the extra benefits and rewards that come attached to many of them. Ideally a business credit card should be paid off in full every month to maximize the positive impact on a business’ credit rating but if that is not initially possible looking for credit cards for business that have a low APR should be you most important concern. It is important that you look beyond any 0% APR introductory offers to what the real “regular” APR will be as that can be surprisingly high, putting your business at risk for overspending. If you do intend to use business credit cards merely as a way to keep better track of your account and build credit and do intend to pay off most monthly balances right away the APR attached to them is of less importance. In this case you might want to look more closely at the rewards attached to them which can range from straight cash back bonuses and air miles to points towards purchasing office equipment or rewards for business travel. If your business has employees you may want to be able to give them a company credit card to use as well. This can avoid the hassle of having to deal with expense reports and reimbursement. If this is a feature you will be looking for in a business credit card seek out those that offer additional cards at no extra cost, or at least for a fee that is minimal. There are business credit cards available that allow you to set a spending limit for individual cards, another big help when it comes to balancing the books. It also avoids any unpleasant disagreements about employees claiming too many things as business expenses and allows you to manage just how much is being spent on certain things. Should You Get More Than One Business Credit Card? Most business owners find it is simpler and more efficient to chose one of the many credit cards for business that are available and stick to using that card only. Some do find that it helps to have a business credit card and a business charge card like an American Express card but beyond that having too many business credit card accounts can damage, rather than enhance, a business’ credit profile as it may make them appear to the credit bureaus that they are over extended. Switching business credit cards is a different matter though. If you happen to find a lower APR card than the one you have, or a card with better rewards transferring the balance from card you already have may help save you money or get more from business spending. Before doing so check what the fees associated with balance transfers are, as they can be as high a 5% or more of the amount you are intending to transfer.